For example, if we are looking to transform the squad over the next couple of windows, choosing a manager who has previously been successful in the market while still making a high volume of transfers could be key. Conversely, if we are looking to stick to a tight budget or develop younger players, a manager who is used to being active in the market might not be the best fit. 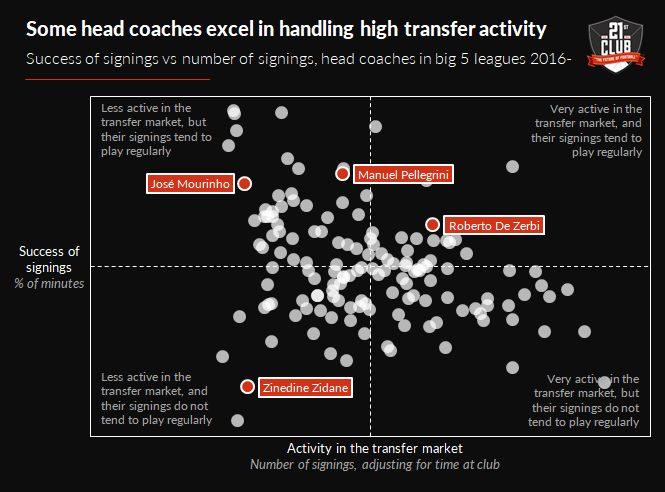 We can judge a manager’s success in transfer dealings by looking simply at how much pitch time they give to their signings; the last thing a club wants is to leave newly-spent money off the field. Roberto De Zerbi has managed multiple Serie A clubs since the 2016/17 season. He has been fairly active in the transfer market over this period while maintaining above average success, signing players who went on to be used regularly by the club. His relative success at Benevento meant Sassuolo were comfortable he could handle the large turnover of players after his appointment last summer. Since taking over at West Ham in the summer prior to the start of the 2018/19 season, Manuel Pellegrini has made a number of successful signings. In particular, Fabianski, Felipe Anderson and Diop have all played over 90% of minutes in league matches, before even considering the fact that he has been unlucky with new signings Yarmolenko and Carlos Sánchez suffering long-term injuries. As when scouting potential new players, it is important to look at whether a manager will be a good fit for our club and the context of their past success. Looking at their history in the transfer market can ensure we do not have unrealistic expectations of their ability to transform our squad.